June 20th is Ice Cream Soda/Milkshake day, and since my husband celebrated his birthday this week I decided to create a healthy frozen mocha just for him. 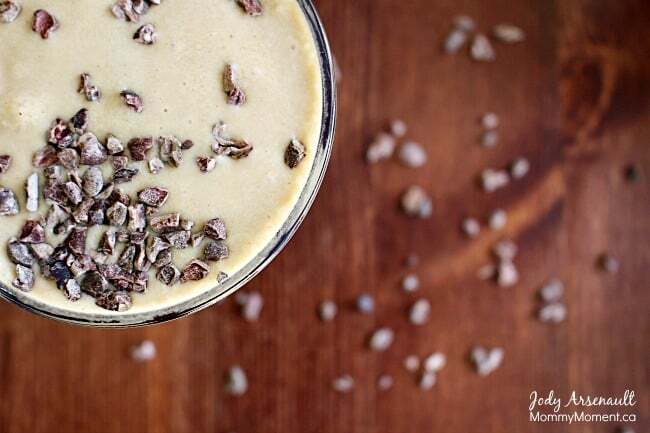 This delicious healthy version of an ice cream drink contains no ice cream (gasp), but it tastes like a frozen mocha and the bonus is that it is actually a much healthier drink than many of the ice cream varieties. I like to serve this healthy frozen mocha with ice cubes and some cacao nibs sprinkled on top. This is a healthy version of a ice cream drink or frozen mocha, it has no refined sugar and looks absolutely delicious topped with Cacao nibs. Stir together the instant coffee and hot water and place in a blender (I use a vitamix). Add 5 ice cubes, coconut milk, banana, almond butter, honey and the Himalyan pink salt into the blender. Blend using the tamper tool until mixed well. Pour into a glass add 2-3 more ice cubes, a straw and sprinkle the top with cacao nibs. 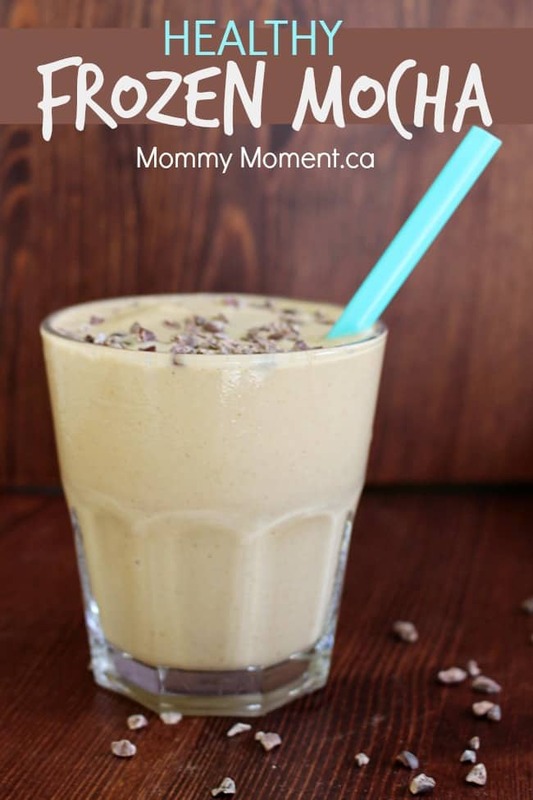 If you have a love of chocolate you could add 1/2 a tsp of cocoa powder to the blender when you make this drink to make it a healthy frozen chocolate mocha. You may also like this frozen hot chocolate recipe. Thank you for this healthier version. I have been craving a frozen drink but hate all the sugar and calories most of them have. This will be so good on all the hot summer days we have coming!! Now this is my idea of a great refreshing summertime drink!! These sounds totally deliciously awesome! Will have to give these a try. Thanks for sharing, I love my ice caps and what not, but being just diagnosed with diabetes, I can no longer drink them so anything like this drink I will totally make! !